Our vines are plowed by a vineyard plow, and some plots are grassed in the middle of the row. Some growing operations can simply not be planned: they must be carried out according to the state of the soil, but also weather conditions. Thus, we installed a weather station in the vineyard in order to allow us to conduct sustainable practices. Autumn and winter are times of rest for the vine which has just given its fruits. We use this dormant stage to maintain the surroundings of the vineyard, as well as its “structure” (stakes, threads, vines to change, moorings). 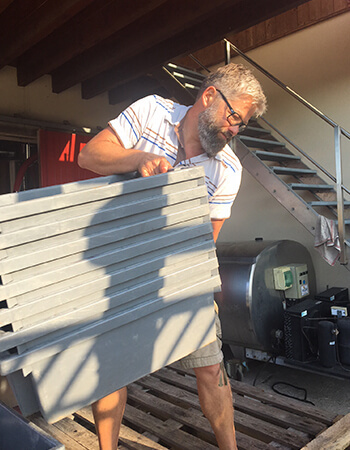 We must also prepare the vines for the future rise of sap by pruning, then bending them to reform the trellising.”structure” of it (stakes, threads, vines to change, moorings). We must also prepare the vines for the future rise of sap by cutting the woods (branches), then bending them to reform the trellising. The Château Haut-Plantade offers its vine shoots!Do not hesitate to pick them up in our rows for your future barbecues! In spring, the sap rises up into the woods. After follows the budbreak that will give new fruit-bearing shoots, then the leaves, and finally the flowers that become bunches of grapes. With the heat, the vine grows quickly. It is therefore necessary to channel them by lifting the trellis wires in order to straighten them (lifting and straightening). 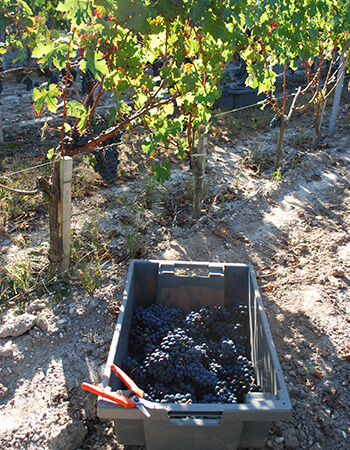 Green harvesting, leaf and crop thinning to gain grape quality, are done manually, just like the harvesting of grapes. 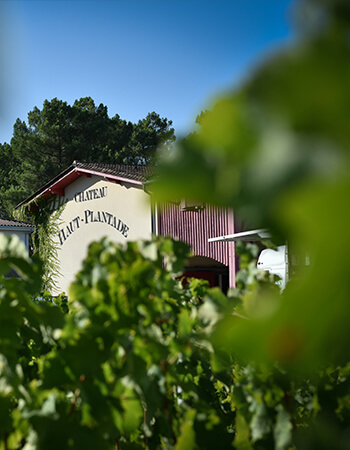 At the Château, the grape harvest takes place once grapes have reached perfect maturity, for the Sauvignon Blanc and Sémillon this usually occurs during the first half of September.Grapes are delicately picked after which they are placed in small crates (15 kg) so as to avoid being crushed before reaching the winery. Two red grape varieties, Merlot and Cabernet Sauvignon, constitute our vines, but they do not mature at the same time. The harvesting of the reds begins with the merlots towards the end of September, and then continues a few weeks later with the cabernets. In the same way as for the white grapes, we wait for the perfect maturity of our berries before harvesting. After separation of the grains, a sorting phase takes place during which we remove foreign bodies, plants, immature berries and visibly damaged berries, to keep only the perfectly matured berries. After this operation, a light crushing is carried out before the tanks are filled. Elaborating white wines is, in general, more delicate than that of red wines because the raw material is more sensitive to oxidation. 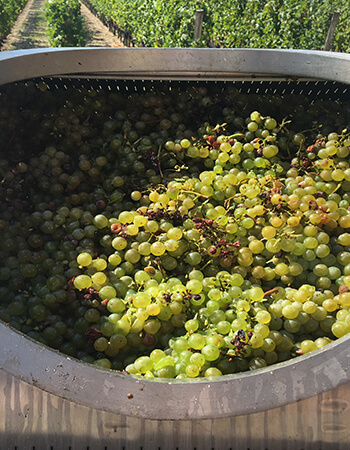 Thus, the vinification of white wines differs from that of red wines because it does not seek the contact between the solid part of the harvest (skin, seeds) and the resulting juice. 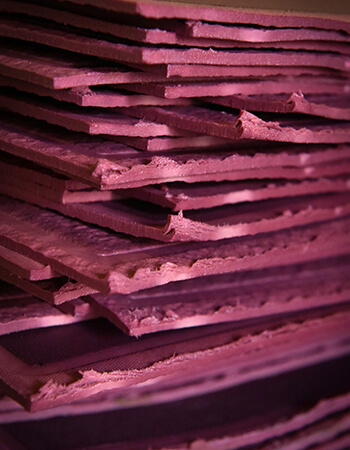 The extraction of the juice is therefore done with maximum care by using drainage (separation of the juice from the solids) allowing the skin maceration, then “measured” pressing by a pneumatic press. At the exit of the press, juices are cloudy. They are therefore sent into vats to be clarified, that is to say, freed from their particles after the latter have been deposited by the addition of cold. Once the must is set, the must is then placed in barrels and in vats for low temperature fermentation. After fermentation, we stir the lees, favoring the exchange between the lees and its wine. The interest of this ancestral technique is to develop the autolysis of yeasts to give more body and fat to the wine, while promoting the development of fine and complex aromas. 40% in stainless steel tanks. After the wine is placed in the vats, the temperature is dropped to 6 °C. The tank is under carbon dioxide (CO2) to avoid fermentation from starting (cold pre-fermentation), which will take place for a few days. This operation allows various components of the grape (skin, seeds, juice) to bring colors and aromas; the wines are thus more structured and round, the tannins less harsh. Alcoholic fermentation takes place, afterwards, at a temperature of 25-30 ° C, punctuated by daily pumping over a spread of three weeks. This maceration of must, then of wine, is regularly checked, tasted and analyzed by a consulting oenological laboratory in order to monitor its evolution. This vintage will be entirely aged between 12 and 16 months (depending on the vintage) in French oak barrels, 1/3 of which are renewed each year. During the aging, racking is carried out every four months. Before bottling at the Château, the reds will go through fining, with the use of egg whites according to the ancient tradition. Hardly any filtration will take place.